Boat International has exclusive images of Tansu Yachts' latest launch Only Now, which was delivered on 5 August after 17 months of construction. The 34m yacht travelled from Istanbul to Bodrum for her shakedown cruise, stopping at several Greek islands on the way. In May she will begin in the Aegean Sea and travel towards the Western Mediterranean, with stops in Croatia, the Dalmatians and Italy. In late June, she will be at the Boat International Media's Rendezvous in Monaco, 2013. Diana Yacht Design provided the yacht’s naval architecture in collaboration with the yard’s in-house team. 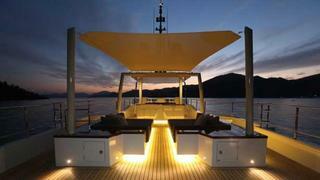 She features modern interiors designed by the yard and the owner as well as large exterior deck areas. Only Now accommodates six guests on the lower deck in a spacious master suite and two double guest cabins. Built in cold-moulded wood and powered by twin 1,700hp Caterpillar engines, she achieves a top speed of 22 knots and a cruising speed of 18 knots. Only Now follows the successful delivery of Nomade (now renamed Bartender) in 2011, winner of a Showboats Design Award. Look out for more on Only Now in forthcoming issues of Boat International magazine.